Ishida, Model DACS, automatic, stainless steel checkweigher. Rated up to 300 feet per minute – depending on materials and application. Weight range: 15 to 1,500 grams. accuracy: +/- 0.1 grams. Equipped with 14" long by 6¼" wide neoprene in feed conveyor, 14" long by 6¼" wide neoprene weighing conveyor and 14" long by 6¼" wide neoprene discharge conveyor with two air blast rejects ( one over / one under). Control panel with touch pad operator interface and visual display. Mounted on a stainless steel frame with height adjustable legs. 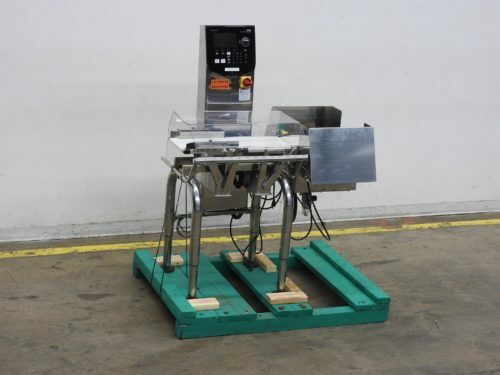 Ishida Model DACS-GN-S015-SS-1, automatic, (3) zone, 304 stainless steel checkweigher. Rated up to 300 feet per minute with number of product – depending on materials and application. Load cell: 14" in Length; 9.5" in Width. Weight range: 6 to 600 grams and 15 to 1,500 grams with Accuracy: +/- 0.05 grams or +/- 0.01 grams respectively with accuracies dependant on materials, application, machine configuration and environment being run in. Equipped with 13.8" long x 9.5" wide neoprene in feed conveyor, stainless steel guide rails, 13.8" long x 9.5" wide neoprene weighing conveyor, 17.7" long x 9.5" wide neoprene discharge conveyor with dual air blast rejects ( one over / one under). Control panel with touch pad operator interface has 7" full color LCD display with 300 "preset" product programs, SUSB memory stick with X-bar charts and histogram and RS232 serial output of raw weight data. Mounted on (4) height adjustable legs. Ishida Model DACS-GN-S015-SS-1, automatic, (3) zone, 304 stainless steel checkweigher. Rated up to 300 feet per minute with number of product – depending on materials and application. Load cell: 14" in Length; 9.5" in Width. Weight range: 6 to 600 grams and 15 to 1,500 grams with Accuracy: +/- 0.05 grams or +/- 0.01 grams respectively with accuracies dependant on materials, application, machine configuration and environment being run in. Equipped with 13.8" long x 9.5" wide neoprene in feed conveyor, stainless steel guide rails, 13.8" long x 9.5" wide neoprene weighing conveyor, 17.7" long x 9.5" wide neoprene discharge conveyor with dual air blast rejects ( one over / one under). Control panel with touch pad operator interface has 7" full color LCD display with 300 "preset" product programs, SUSB memory stick with X-bar charts and histogram and RS232 serial output of raw weight data. Mounted on height adjustable legs. Ishida DACS, automatic, three zone, stainless steel checkweigher rated up to 300 feet per minute – depending on materials and application. Load cell: 14" in Length; 9.5" in Width. Weight range: Weight range: 6 to 600 grams or 15 to 1,500 grams. accuracy: +/- 0.1 grams or +/- 0.2 grams respectively Equipped with 14" long by 9.5" wide neoprene in feed conveyor, stainless steel guide rails, 14" long by 9.5" wide neoprene weighing conveyor, two air blast rejects ( one over / one under), 18" long by 9.5" wide neoprene discharge conveyor and touch pad operator interface with visual display. Mounted on a stainless steel frame with height adjustable legs. Ishida DACS, automatic, three zone, stainless steel checkweigher rated up to 300 feet per minute – depending on materials and application. Load cell: 14" in Length; 9.5" in Width. Weight range: Weight range: 6 to 600 grams accuracy: +/- 0.1 grams or 15 to 1,500 grams. or +/- 0.2 grams respectively Equipped with 14" long by 9.5" wide neoprene in feed conveyor, stainless steel guide rails, 14" long by 9.5" wide neoprene weighing conveyor, two air blast rejects ( one over / one under), 18" long by 9.5" wide neoprene discharge conveyor and touch pad operator interface with visual display. Mounted on a stainless steel frame with height adjustable legs.